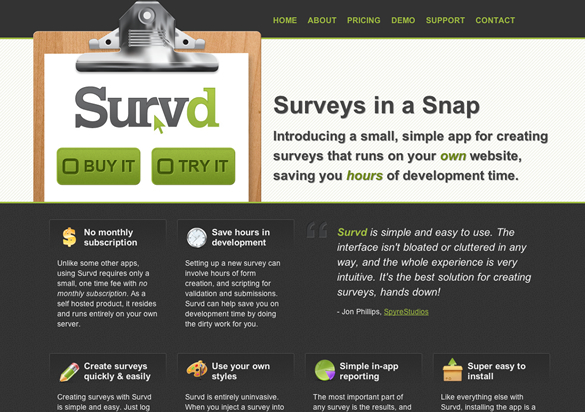 Survd, as the name suggests, is a survey app. With it you can quickly & easily create and implement an unlimited number of surveys on your site or on a client website. 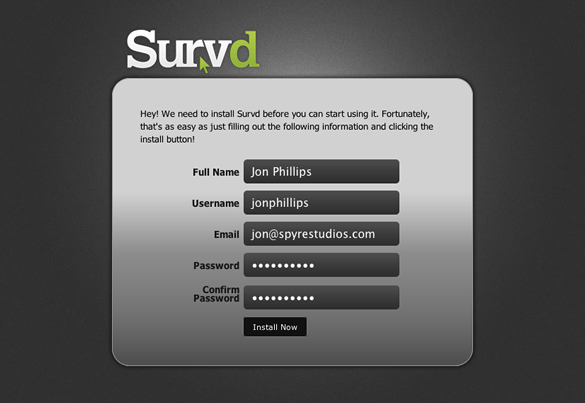 Survd is a hosted solution, it installs in seconds and no database is required (that’s the part that really sold me). I was able to install the app and start creating surveys in less than 5 minutes. Survd normally sells for $49.99, but for a limited time you can get your hands on it for $39.99. Of course with Survd you need not to pay any monthly fees. To enter the giveaway simply leave a comment on this post (with your real name and a valid email address) and tell us why you would like to win. You can also tweet about the giveaway, we will be tracking tweets using Disqus Reactions. We will pick 3 winners using a random number generator. The contest ends on Wednesday, January 12th, 2011 at midnight (0:00) GMT. Winner will be announced shortly after. If you purchase a copy of Survd and you end up winning this contest, you will be refunded the full amount of your purchase. Don’t forget to follow Survd on Twitter as well as Matt. No seriously, I’d like to get this app, simply because, I’m looking for tools to improve productivity, and it’s often hard to find. Also, I follow Matt Ward and his work, and trust him about this app. Are you commenting here because you wanna win? Awesome Application that will allow me to gain the feedback of clients and well as deliver this option to clients on a day by day basis. No seriously, count me in. Looks awesome! I have a plan for this if I win. I need to know what people think of me. Cool application to use.. If ever i’ll be one of the lucky chosen, it will be my first paid app to use in my site..
Like many of the good looking offerings out there in Web X.0 land… more attention to detail is needed in order to meet the requirements of ALL users regardless of their ability. But hey,.. I am sure that for the rest of you it will do just fine. I am an instructional designer, and I’m trying to start my own consulting business. I often need surveys to demonstrate to clients I can do the project, or I use surveys throughout a project to get critical information a client needs to improve training for the employees. I hope to win and try it out! I work in sales and Survd would be perfect for generating field surveys for my clients. I value what Matt is doing for myself. I must have it. Well this will be a great help to know the feedback of my customers regarding my service. This will be a great help for me because atlast there is a tool that will help me know the feedback of my customers to my service. Awesome! Thanks for the giveaway I have not seen Survd but I will look into using them! If you don’t win here, there’s another license being given away on Visualswirl.com. And if you don’t win either, go buy the app. It’s a great tool.